Rafael Nadal has lifted US open Grand Slam of this year by beating world no.1 Novak Djokovic and maked his second US open title. Its his 13th Grand slam. 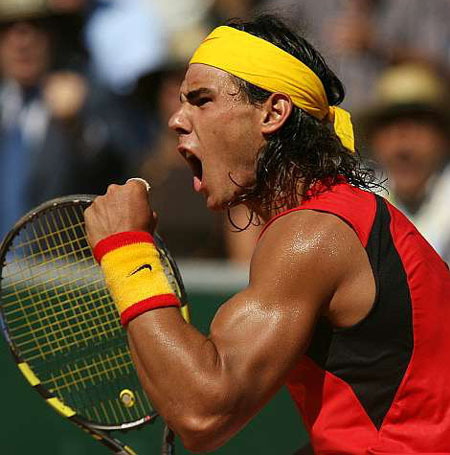 The match was quite interesting and Nadal won the match of four sets with 6-2, 3-6, 6-4 and 6-1. The US open grand slam added him with $3.6 billion earnings thus making his career earnings of $60 million. Look that image below to see the celebrations after Nadal lifting his second US open title. Nadal is at the place of world no.2 and lifted his 13th Grand Slam by winning this US open. Thus he marked him to be the third most Grand Slam winners. The list is topped by Roger Federer with 17 grand Slams and Pete Sampras with 14 Grand Slams. He is just one behind Pete Sampras. Rafael Nadal is an 27 years old Spanish player. Its his great honor to win US open and he said that its quite interesting and tough to face world no.1 Djokovic. Nadal faced Djokovic in his 18th grand finals and lifted his US open. Its his great come back to this tournament after his seven months breakup due to injury. He said that he used to take off the ball so early and he have corrected it through this series and thus made his US open grand slam. He won the macth in 3 hours and 20 minutes. Rafael Nadal was in poor form last year and he lost Wimbledon few months ago pressured him to retire at his earlier age of 26. Then followed by that he had injured and left out of the matches for around 7 months. This year has been a wonderful year for Nadal career because he has won 10 titles and made a season records of 60 wins and left out with just three lose. For Djokovic too, its his successive final at New York for the fourth time but ended up with a great defeat. Nadal has marked his career with five Maters, two US open by this match and an Australia open. Rafael Nadal said Djokovic is great sportsman and facing him is quite interesting because he make Nadal to put himself with limitations. Rafael Nadal had made his mark throughout the year and entertained his fans. Readers can share their views on the US open and Rafael Nadal.